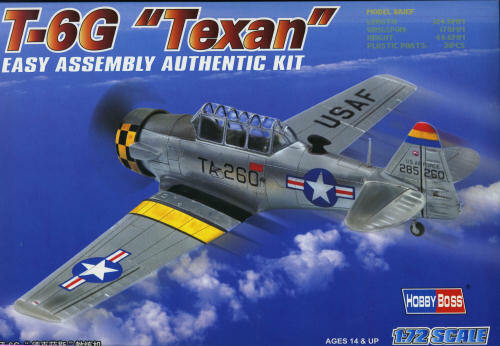 The T-6 Texan was a single-engine advanced trainer aircraft designed by North American Aviation, used to train fighter pilots of the United States Army Air Forces, United States Navy, Royal Air Force and other air forces of the British Commonwealth during World War II. The T-6 is known by a variety of designations depending on the model and operating air force. The USAAC called it the "AT-6", the US Navy, the "SNJ", and British Commonwealth air forces, the Harvard. It remains a popular warbird aircraft. During the Korean War and to a lesser extent, the Vietnam war, T-6s were pressed into service as forward air control aircraft. These aircraft were designated T-6 "Mosquito"s. The RAF used the Harvard in Kenya against the Mau Mau in the 1950s where they operated with 20 lb bombs and machine guns against the gangs. Some operations took place at altitudes around 20,000 ft asl. A Harvard was the longest-serving RAF aeroplane, with an example, taken on strength in 1945, still serving in the 1990s (as a chase plane for helicopter test flights - a role the Shorts Tucano's high stall speed was ill-suited for). The T-6G was also used in a light attack or counter insurgency role by France during the Algerian war in special Escadrilles d'Aviation Légère d'Appui (EALA), armed with machine guns, bombs and rockets. At its peak there were 38 EALA's active. The largest unit was the Groupe d'Aviation Légère d'Appui 72, which consisted of up to 21 EALAs. Portugal also used ex-French aircraft during the Portuguese Colonial War. Since the Second World War, the T-6 has been a regular participant at air shows, and was used in many movies. For example, in Tora! Tora! Tora! and The Final Countdown, converted single-seat T-6s painted in Japanese markings represent Mitsubishi Zeroes. The New Zealand Warbirds "Roaring 40s" aerobatic team use ex-Royal New Zealand Air Force Harvards. The Reno National Air Races also has a class specifically for the T-6 during the National Air Races each year. This one is pretty typical of their $10 kits. Basically a two section wing/fuselage with a complete upper fuselage section and the lower fuselage in with the one-piece wings. The cockpit has but a pair of seats, there is a one-piece canopy, one-piece stabilizers and the rest of the small pieces are for landing gear, engine, cowling, prop and landing light covers. A small section of wire is provided as a prop shaft. The kit also has an insert for the forward wheel wells. This part has some sink holes that you may wish to fill. The only real options are for a 'football' style ADF antenna or the lower and flush mounted one used for the ARN-6 system. I should also mention that the kit comes with wheel well doors. Now this feature was not often found on later T-6s like this one as it was found to be unnecessary. Many of these also had larger P-51D tail wheels. This is basically a T-6G as you can tell by the spinner and the large side panes in the greenhouse. The instructions are quite basic, but then, so is the kit. Gunze paint references are used and the colorful decals are for two planes. One is a Korean war plane from the 6147 TCS in 1952. The other is a Chinese PLAAF plane that was undoubtedly taken over from the Nationalist Chinese when they departed the mainland. 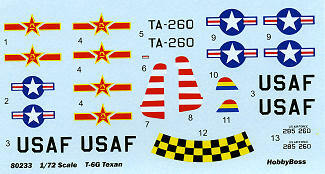 Both schemes are shown in color on the back of the instruction sheet. Both are unpainted metal with black or olive drab anti-glare panels. The wing bands on the USAF plane will need to be painted. Decals are quite well printed and should provide no surprises. As I've mentioned, I've found Hobby Boss decals to be very good. At time goes by, I find kits like this to be a pleasant break from those that require a ton of work to finish. To be sure, the large fuselage seam will need attention, but the rest of the kit should build quickly and if you are not picky about the somewhat bulky bits from time to time and the lack of cockpit detail, then these are great. Besides, they will sit on your shelf at home and few will be aware of their shortcomings. Thanks to 'store credit' at CRM for this one.